 St. John's to Sao Paulo, Brazil - $470 CAD roundtrip | new record! 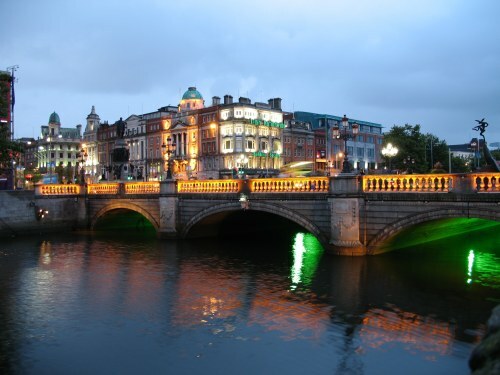 WestJet has dropped the price of a few of their October flights from St. John's, Newfoundland to Dublin, Ireland down to $388 CAD roundtrip including taxes. The flights are non-stop each way. 2. Click through from Kayak to the WestJet website. Some dates require booking 2 separate one way tickets on WestJet. Follow the steps on Google Flights. screenshot from the the WestJet website. st johns, yyt, westjet, flight deals, europe, western europe, united kingdom, dublin, ireland and dub. Head to the YYT Deals Alerts Page where you can choose to be notified by e-mail, Facebook, Twitter, or RSS Feed the moment an amazing travel deal from St. John's is found. 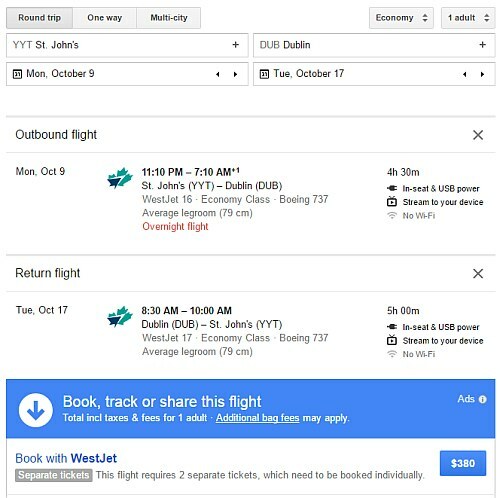 2 Responses to "St. John's to Dublin, Ireland - $379 CAD roundtrip including taxes | non-stop flights"
Thanks Wayne! That is definitely appreciated. I'm glad it helps! * crowdsource the best travel deals from YYT?